The patented PAXLight system utilizes a 3 pod LED head design with 5X the brightness of traditional Halogen Field Hospital Lights. The PAXlight has cooling fans over each LED head increasing the life of the LED bulbs and keeping the surface of the light cool to the touch. The PAX is a rugged design that is field tested to be sand resistant and splash resistant. The units come equipped with ergonomically designed durable, stackable and easily transportable hard case. LED Technology The LED lamps offer an intense light that is five times brighter than traditional halogen field lights. Yet they are cool to the touch, project no heat on patient and have an exceptionally long life. 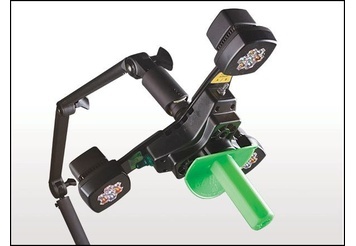 Jameson’s PAXLight® is available in a 36” focal length model with multiple mounting options.